I was recommended this book by a friend and fellow book lover who wanted to talk about the ending with someone. After at last acquiring the book, I dove right in, anxious to find out what has so befuddled my friend. I was caught up in the book very quickly and enjoyed the writing style. I am not the greatest fan of classic literature, often because the language is so formal or dry. 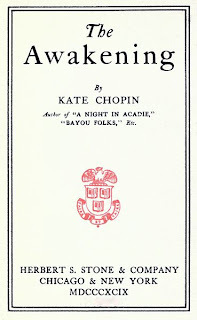 The language in the Awakening, however, was readable. I enjoyed the subtle descriptions and the little douses of humour. The protagonist, Mrs Edna Pontellier, I found to be an interesting character. I had to continue reminding myself about the time in which she lived and that her actions, though they may seem simple today, were revolutionary for her day. This book is considered one of the first and leading works in feminist literature. Gradually, throughout the novel, Mrs Pontellier begins first to see herself as an independent and self-directed being and then to assert her self-direction. Her actions, though encouraged by one friend, are generally discouraged by the rest of her social group, particularly her husband who believes she is becoming mentally unstable. Though Mrs Pontellier does begin to assert her own will over the events of her life, she does so somewhat underhandedly. She moves out of the family house while her husband is away on business. Though her actions are a step for her in leading her own life, she does not come against any opposition or realise the consequences of moving away from her family. Her children are not aware of her actions as they are away on holiday and her husband is easily able to cover up her move as something socially acceptable. I am uncertain as to how much independence she was able to achieve by moving. The rubber never really hit the road. Nonetheless, I found her actions admirable for her day. I also find it a pity that such actions were necessary. Today, in many places worldwide (though not all), for a women to assert her sense of will, self, and independence, she does not need to leave her husband and children. As she begins to claim direction over her own life and actions, she becomes somewhat childish, doing only as she pleased. In some senses, good for her, having the luxury to do only what she wanted. However, in reality, life has responsibilities whether you feel a sense of self will and independence or not. I also find her actions somewhat poorly motivated. She became restless in her own life once she fell in love with a man not her husband. Were her actions motivated in order to be able to pursue a relationship with this man? In this case, yes, she is asserting her own will, but she is still operating under the influence of a man. I am not suggesting that true feminism should be free of men. I suppose the achievement of realising her own wishes and desires and then pursuing them is mighty step for the day. Furthermore, though Mrs. Pontellier's actions are shocking to many of those around her, she wasn't acting entirely alone. The book mentions rumblings of women's radical groups at the time. Undoubtedly, Mrs. Pontellier heard whispers of women acting independently from their husbands. However, the books certainly portrays her actions as completely separate from these groups and movements. She does not socialise with any of the women in these groups. The books describes her change in attitude as an awakening, something that grew from within her, almost divinely. The author describes such a change in the protagonist from this awakening, that her physical appearance changes and she is healthier, more robust, and lively. I suppose, despite the movements and whispers of the day, each woman had to discover herself, something which is often taken for granted in modern day. An aspect that I particularly enjoyed was a subtyl discussion about independence and loneliness. The initial steps of asserting independence were incredibly excited for the protagonist. However, loneliness was also an aspect of her activities. As the initial bustle of establishing her independence settled, loneliness set in and she sought company. I appreciated the discussion of somehow finding balance between independence and loneliness. The ending is striking. After witnessing her good friend go through child birth and hearing her pleas to "think of the children," she becomes confused about her actions. Mrs Pontellier was not particularly maternal, but due to social demands, married and had two children. Being of the wealthier class in the late 1800s, she didn't have much to do with child-minding and left her children mostly in the care of the quadroon. After witnessing the childbirth, at the end of the novel, she begins to think of her children and express affection for them. She had previously said that she would give her life, but never herself for her children. This aspect of the novel, I admit, I find confusing. Whereas her relationship with her children is clear throughout the novel, in the last pages, the Mrs Pontellier seems to reconsider this relationship and the role of her two young boys. I am uncertain how the childbirth event affected her final actions. The ending is at once shocking and unsurprising. Perhaps I wasn't surprised because I was warned about the ending (without knowing actually what happens) and was constantly preparing myself for the worst possible situations. I wondered if her final action was because she was not able to obtain what she wanted, even though she pursued it with all her will. I wondered if she was not able to reconcile her sense of self with the way society saw women and a woman's role. I wondered if she was simply heartbroken. I can't explain it. I lean to the idea that she was simply not able to reconcile her responsibility as a mother with her awakened independence. I very much enjoyed this novel. I enjoyed reading about women in the late 19th century. I enjoyed seeing the first steps in feminism, as women began to act with independence. Though the actions of the protagonist seem small to me, looking back from today, I can also understand how big they were in the late 1800s. I would certainly recommend this novel. The writing style is lovely and I think any one of us should understand how things were for women and how difficult those first assertive steps were. 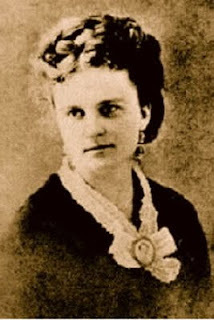 Kate Chopin (nee O'Flaherty) was born in 1850 in St Louis, USA. She lived with her mother, grandmother, and great-grandmother, all widows and was mostly educated at home by her great-grandmother. Her mother was the first woman to achieve legal separation from her husband in St Louis and raise 5 children while running a shipping business on the Mississippi. Kate eventually went to Sacred Heart Academy in 1865, graduating in 1868. She was married in 1870 to Oscar Chopin. They had 6 children together, all by the time Kate was age 29. After the failure of Oscar's cotton business in 1879, they moved to Cloutierville, Louisiana and Kate was exposed to Creole culture. Oscar died in 1889, leaving Kate with $12 000 of debt. Kate sold his businesses and returned to St Louis to her mother. However, her mother died the following year. Kate was encouraged to write in order to overcome the depression in which she found herself after the death of her husband and mother. She began writing short stories and was publishing articles and stories in local publication by 1890. 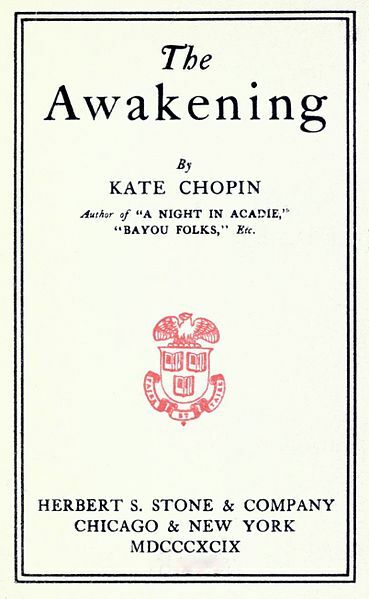 The Awakening, her second novel, was published in 1899 and came against much criticism for its poor moral standards. It was out of print for a few decades, but has become one of the leading works in feminist literature. Discouraged by so much criticism, however, Kate turned to short stories. She died of a brain hemorrhage in 1904. 1. I liked learning about the first steps of women asserting their independence and will. 2. I liked the protagonist and reading about how she came to realise herself. 3. I liked the writing style and descriptive writing. 4. I liked the ending. In part, it confuses me. In part, I totally understand it.